The CN-E 14mm T3.1 L F Cinema Prime Lens is designed to provide outstanding optical performance and is capable of full 4K-Resolution performance. Whether you're shooting in HD with a Canon EOS DSLR camera or in 4K using an EOS C500 Digital Cinema Camera, the CN-E 14mm T3.1 L F will help you to create a cinematic masterpiece by providing superb image quality, contrast and color fidelity. 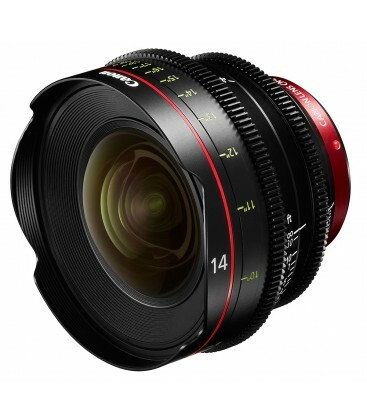 The CN-E 14mm T3.1 L F Cinema Prime Lenses features a genuine Canon EF mount and works with all Cinema EOS camera models, as well as, all EOS HD-DSLR cameras including Full-Frame models. The EF mount has electronic contacts on both the lens and camera sides that allow direct communication between each device. This communication allows lens metadata including T-numbers to be displayed in the viewfinder. Both the T-number and the focus position are recorded in the video file. The use of an 11-blade iris produces artistic and beautiful out-of-focus areas or "Bokeh." The 11 blades allow for attractive circular blurring in out-of-focus regions, while the use of an odd number of blades help reduce flaring of specular highlights. Additionally, the iris ring is mechanically controlle with no click stops for smooth exposure adjustments while recording. Designed to meet the needs of professional cinematographers, the CN-E 14mm T3.1 L F Cinema Prime Lens features unified front lens diameters and gear positioning on the focus and iris rings making lens switching quick and convenient. Additionally, the Focus ring features 300º of smooth rotation to help facilitate consistently accurate focusing especially when pulling focus during a shot. Control rings work to maintain the right amount of resistance and operating torque in order to help provide the camera operator or assistant with a consistent feel and predictable lens operation. The CN-E 14mm T3.1 L F Cinema Prime Lens is equipped with gaskets and seals for dust and water resistant operation, helping to make them ready for shooting, even in severe conditions. The CN-E 14mm T3.1 L F Cinema Prime Lens is designed to minimize variations in the angle of view while focusing, a phenomenon known as focus breathing. This feature is extremely important while focus pulling, where changes in the angle of view due to focus breathing could become apparent to the viewer. To allow for additional ease of use and flexibility the CN-E 14mm T3.1 L F Cinema Prime lens features threading on the front of the lens to accommodate 105mm screw on filters. This feature allows the camera operator to add filters over the lens without the need for a Matte Box to be attached to the camera system helping to provide flexibility in filter choice as well as the ability to shoot in a more streamlined format. - Weight: 1.2 kg / 2.65 lb. The CN-E 24mm T1.5 L F Cinema Prime Lens is designed to provide outstanding optical performance and is capable of full 4K-Resolution performance. Whether you're shooting in HD with a Canon EOS DSLR camera or in 4K using an EOS C500 Digital Cinema Camera, the CN-E 24mm T1.5 L F will help you to create a cinematic masterpiece by providing superb image quality, contrast and color fidelity. The CN-E 24mm T1.5 L F Cinema Prime Lenses features a genuine Canon EF mount and works with all Cinema EOS camera models, as well as, all EOS HD-DSLR cameras including Full-Frame models. The EF mount has electronic contacts on both the lens and camera sides that allow direct communication between each device. This communication allows lens metadata including T-numbers to be displayed in the viewfinder. Both the T-number and the focus position are recorded in the video file. The use of an 11-blade iris produces artistic and beautiful out-of-focus areas or "Bokeh." The 11 blades allow for attractive circular blurring in out-of-focus regions, while the use of an odd number of blades helps reduce flaring of specular highlights. Additionally, the iris ring is mechanically controlled with no click stops for smooth exposure adjustments while recording. Designed to meet the needs of professional cinematographers, the CN-E 24mm T1.5 L F Cinema Prime Lens features unified front lens diameters and gear positioning on the focus and iris rings making lens switching quick and convenient. Additionally, the Focus ring features 300º of smooth rotation to help facilitate consistently accurate focusing especially when pulling focus during a shot. Control rings work to maintain the right amount of resistance and operating torque in order to help provide the camera operator or assistant with a consistent feel and predictable lens operation. The CN-E 24mm T1.5 L F Cinema Prime Lens is equipped with gaskets and seals for dust and water resistant operation, helping to make them ready for shooting, even in severe conditions. 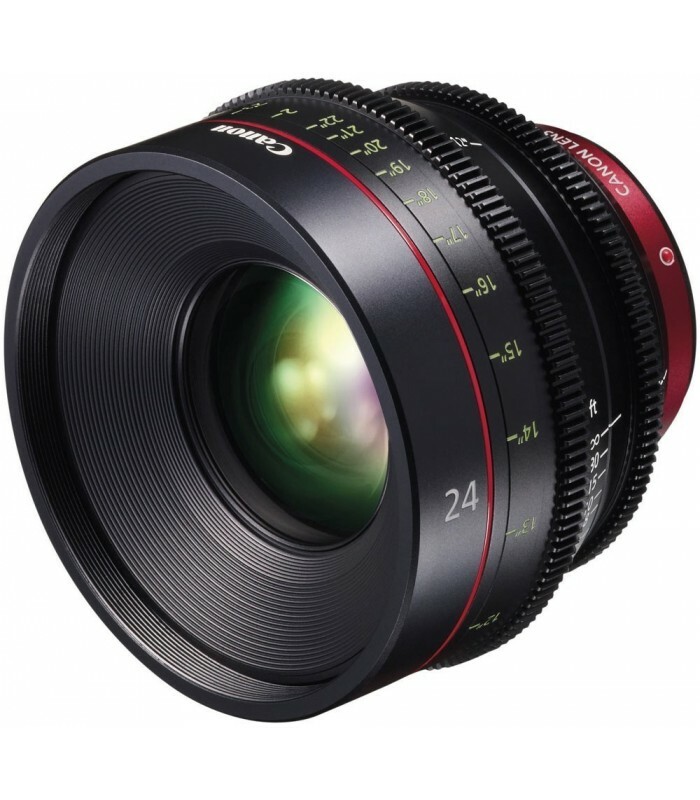 The CN-E 24mm T1.5 L F Cinema Prime Lens is designed to minimize variations in the angle of view while focusing, a phenomenon known as focus breathing. This feature is extremely important while focus pulling, where changes in the angle of view due to focus breathing could become apparent to the viewer. To allow for additional ease of use and flexibility the CN-E 24mm T1.5 L F Cinema Prime lens features threading on the front of the lens to accommodate 105mm screw on filters. 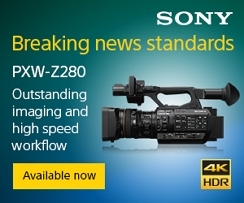 This feature allows the camera operator to add filters over the lens without the need for a Matte Box to be attached to the camera system helping to provide flexibility in filter choice as well as the ability to shoot in a more streamlined format. The CN-E 35mm T1.5 L F Cinema Prime Lens is designed to provide outstanding optical performance and is capable of full 4K-Resolution performance. Whether you're shooting in HD with a Canon EOS DSLR camera or in 4K using an EOS C500 Digital Cinema Camera, the CN-E 35mm T1.5 L F will help you to create a cinematic masterpiece by providing superb image quality, contrast and color fidelity. The CN-E 35mm T1.5 L F Cinema Prime Lenses features a genuine Canon EF mount and works with all Cinema EOS camera models, as well as, all EOS HD-DSLR cameras including Full-Frame models. The EF mount has electronic contacts on both the lens and camera sides that allow direct communication between each device. This communication allows lens metadata including T-numbers to be displayed in the viewfinder. Both the T-number and the focus position are recorded in the video file. Designed to meet the needs of professional cinematographers, the CN-E 35mm T1.5 L F Cinema Prime Lens features unified front lens diameters and gear positioning on the focus and iris rings making lens switching quick and convenient. Additionally, the Focus ring features 300º of smooth rotation to help facilitate consistently accurate focusing especially when pulling focus during a shot. Control rings work to maintain the right amount of resistance and operating torque in order to help provide the camera operator or assistant with a consistent feel and predictable lens operation. The CN-E 35mm T1.5 L F Cinema Prime Lens is equipped with gaskets and seals for dust and water resistant operation, helping to make them ready for shooting, even in severe conditions. 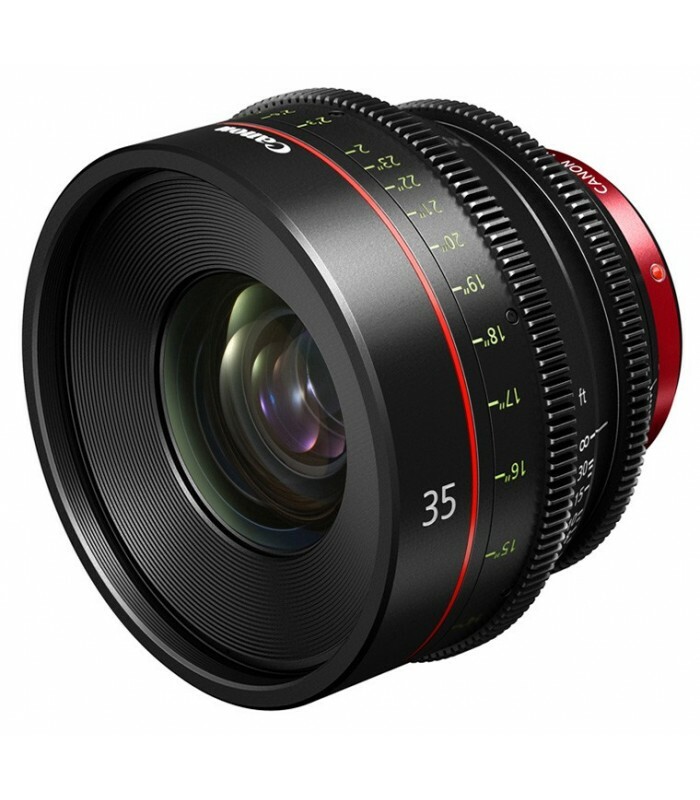 The CN-E 35mm T1.5 L F Cinema Prime Lens is designed to minimize variations in the angle of view while focusing, a phenomenon known as focus breathing. This feature is extremely important while focus pulling, where changes in the angle of view due to focus breathing could become apparent to the viewer. To allow for additional ease of use and flexibility the CN-E 35mm T1.5 L F Cinema Prime lens features threading on the front of the lens to accommodate 105mm screw on filters. This feature allows the camera operator to add filters over the lens without the need for a Matte Box to be attached to the camera system helping to provide flexibility in filter choice as well as the ability to shoot in a more streamlined format. The CN-E 50mm T1.3 L F Cinema Prime Lens is designed to provide outstanding optical performance and is capable of full 4K-Resolution performance. Whether you're shooting in HD with a Canon EOS DSLR camera or in 4K using an EOS C500 Digital Cinema Camera, the CN-E 50mm T1.3 L F will help you to create a cinematic masterpiece by providing superb image quality, contrast and color fidelity. The CN-E 50mm T1.3 L F Cinema Prime Lenses features a genuine Canon EF mount and works with all Cinema EOS camera models, as well as, all EOS HD-DSLR cameras including Full-Frame models. The EF mount has electronic contacts on both the lens and camera sides that allow direct communication between each device. This communication allows lens metadata including T-numbers to be displayed in the viewfinder. Both the T-number and the focus position are recorded in the video file. Designed to meet the needs of professional cinematographers, the CN-E 50mm T1.3 L F Cinema Prime Lens features unified front lens diameters and gear positioning on the focus and iris rings making lens switching quick and convenient. Additionally, the Focus ring features 300º of smooth rotation to help facilitate consistently accurate focusing especially when pulling focus during a shot. Control rings work to maintain the right amount of resistance and operating torque in order to help provide the camera operator or assistant with a consistent feel and predictable lens operation. The CN-E 50mm T1.3 L F Cinema Prime Lens is equipped with gaskets and seals for dust and water resistant operation, helping to make them ready for shooting, even in severe conditions. 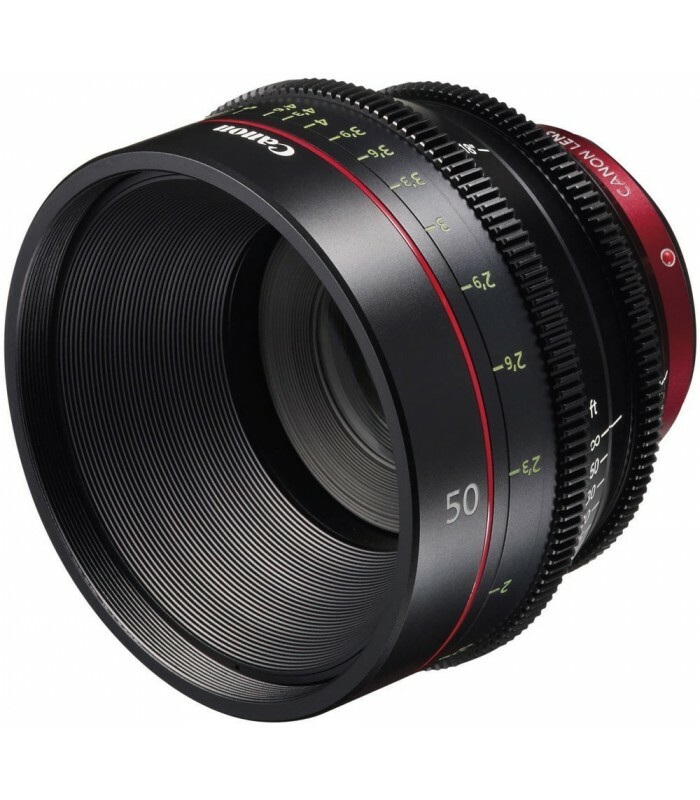 The CN-E 50mm T1.3 L F Cinema Prime Lens is designed to minimize variations in the angle of view while focusing, a phenomenon known as focus breathing. This feature is extremely important while focus pulling, where changes in the angle of view due to focus breathing could become apparent to the viewer. To allow for additional ease of use and flexibility the CN-E 50mm T1.3 L F Cinema Prime lens features threading on the front of the lens to accommodate 105mm screw on filters. This feature allows the camera operator to add filters over the lens without the need for a Matte Box to be attached to the camera system helping to provide flexibility in filter choice as well as the ability to shoot in a more streamlined format. The CN-E 85mm T1.3 L F Cinema Prime Lens is designed to provide outstanding optical performance and is capable of full 4K-Resolution performance. Whether you're shooting in HD with a Canon EOS DSLR camera or in 4K using an EOS C500 Digital Cinema Camera, the CN-E 85mm T1.3 L F will help you to create a cinematic masterpiece by providing superb image quality, contrast and color fidelity. 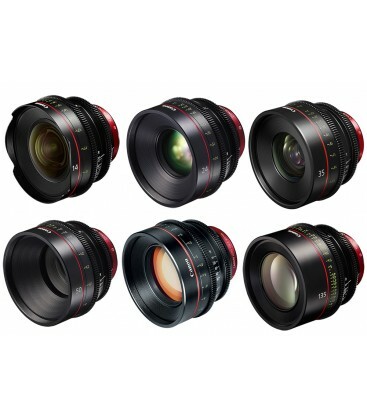 The CN-E 85mm T1.3 L F Cinema Prime Lenses features a genuine Canon EF mount and works with all Cinema EOS camera models, as well as, all EOS HD-DSLR cameras including Full-Frame models. The EF mount has electronic contacts on both the lens and camera sides that allow direct communication between each device. This communication allows lens metadata including T-numbers to be displayed in the viewfinder. Both the T-number and the focus position are recorded in the video file. Designed to meet the needs of professional cinematographers, the CN-E 85mm T1.3 L F Cinema Prime Lens features unified front lens diameters and gear positioning on the focus and iris rings making lens switching quick and convenient. Additionally, the Focus ring features 300º of smooth rotation to help facilitate consistently accurate focusing especially when pulling focus during a shot. Control rings work to maintain the right amount of resistance and operating torque in order to help provide the camera operator or assistant with a consistent feel and predictable lens operation. The CN-E 85mm T1.3 L F Cinema Prime Lens is equipped with gaskets and seals for dust and water resistant operation, helping to make them ready for shooting, even in severe conditions. The CN-E 85mm T1.3 L F Cinema Prime Lens is designed to minimize variations in the angle of view while focusing, a phenomenon known as focus breathing. This feature is extremely important while focus pulling, where changes in the angle of view due to focus breathing could become apparent to the viewer. To allow for additional ease of use and flexibility the CN-E 85mm T1.3 L F Cinema Prime lens features threading on the front of the lens to accommodate 105mm screw on filters. This feature allows the camera operator to add filters over the lens without the need for a Matte Box to be attached to the camera system helping to provide flexibility in filter choice as well as the ability to shoot in a more streamlined format. The CN-E 135mm T2.2 L F Cinema Prime Lens is designed to provide outstanding optical performance and is capable of full 4K-Resolution performance. Whether you're shooting in HD with a Canon EOS DSLR camera or in 4K using an EOS C500 Digital Cinema Camera, the CN-E 135mm T2.2 L F will help you to create a cinematic masterpiece by providing superb image quality, contrast and color fidelity. The CN-E 135mm T2.2 L F Cinema Prime Lenses features a genuine Canon EF mount and works with all Cinema EOS camera models, as well as, all EOS HD-DSLR cameras including Full-Frame models. The EF mount has electronic contacts on both the lens and camera sides that allow direct communication between each device. This communication allows lens metadata including T-numbers to be displayed in the viewfinder. Both the T-number and the focus position are recorded in the video file. Designed to meet the needs of professional cinematographers, the CN-E 135mm T2.2 L F Cinema Prime Lens features unified front lens diameters and gear positioning on the focus and iris rings making lens switching quick and convenient. Additionally, the Focus ring features 300º of smooth rotation to help facilitate consistently accurate focusing especially when pulling focus during a shot. Control rings work to maintain the right amount of resistance and operating torque in order to help provide the camera operator or assistant with a consistent feel and predictable lens operation. The CN-E 135mm T2.2 L F Cinema Prime Lens is equipped with gaskets and seals for dust and water resistant operation, helping to make them ready for shooting, even in severe conditions. The CN-E 135mm T2.2 L F Cinema Prime Lens is designed to minimize variations in the angle of view while focusing, a phenomenon known as focus breathing. This feature is extremely important while focus pulling, where changes in the angle of view due to focus breathing could become apparent to the viewer. To allow for additional ease of use and flexibility the CN-E 135mm T2.2 L F Cinema Prime lens features threading on the front of the lens to accommodate 105mm screw on filters. This feature allows the camera operator to add filters over the lens without the need for a Matte Box to be attached to the camera system helping to provide flexibility in filter choice as well as the ability to shoot in a more streamlined format. - Weight: 1.4 kg / 3.09 lb.